Torremolinos is known to be a village since 1801, although there are references to residents before this date. Regarding to the archives of the Cathedral of Malaga, there has been a guard warning about Arab ships, he had observed in the sea, making him the first recorded person residing in Torremolinos. His wage was about 25 maravedies a day, as his occupation required absolute dedication and attention, with penalization of two months without payment or even dismissal. He further had to answer for any damage caused by the enemy due to his negligence. But not always did this system work out well. Some documents of 1522 tell about four Arab ships capturing 17 men from the boat "La Xabega". Another document describes the kidnapping of 40 fishermen in 1524 who never came back and probably were sold as slaves at the bazaars of Oran or Alger. Here the pirate Barbarian had his refuge. On December 17th of 1923 a majority of 446 neighbours out of 695, requested from the Town Hall of Malaga the incorporation of Torremolinos to its municipality. Unfortunately the high debts of 252,288 Ptas and the little money left in the city hall´s cash box made a future viability of the village impossible. The last mayor was Miguel Fernández Alcuaza and there had to pass 64 years until Torremolinos got again its own mayor. It was The Englishman (well known personality in Torremolinos) who in 1930 transformed his country estate Santa Clara into a residence for foreigners who visited the region, being this the beginning of what is now known as Tourism at the Costa del Sol. Soon some neighbours started to follow his example, so too Doña Carlota Alessandri (the main street of Montemar is named after her) who in 1933 restored her country house Cortijo Cucazorra and opened the Parador Montemar, followed by the Hotel La Roca in 1942. Just a few years later, in 1948, the restaurant El Remo opened its doors in the district of La Carihuela. In the same year the quarter lived one its worst historic moments, when in front of Ceuta a fishing boat with 24 men on board foundered, being 12 from La Carihuela, 3 from Bajondillo and the rest from Algeciras and Barbate. Nobody survived but Francisco Campoy "El Cervera" who reached the coast by swimming, still alive; he can tell you the story of the sinking by himself, if you pass by at his home in La Carihuela. Many houses were demolished and instead of the old vegetable gardens appeared big concrete blocks. Boom arrived at the coast and not even the beaches were safe, as they changed their aspect, sun beds and parasols covered every little spot. It was then, when men and youngsters left furrow and plough to start working at the many building sites of hotels, bars and terraces. Torremolinos, since 1924 district of Malaga, starts to shine brightly in the tourism sector. 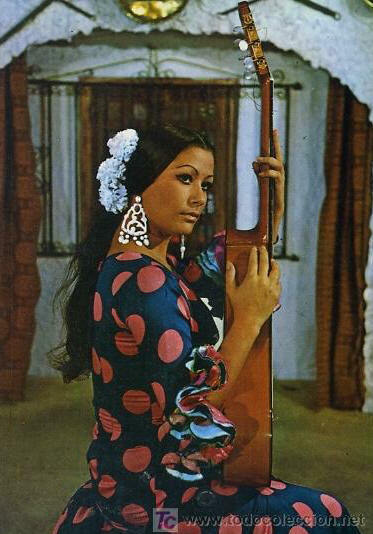 Crowds are filling the Malaga airport and you can meet famous personalities like the actress Ava Gardner, film director Orson Wellles, the actors Boris Karloff and Frank Sinatra in many places such as Café Central, the nightclub El Mañana, the flamenco bars El Jaleo (picture to the right) and El Piyayo. Torremolinos even served as inspiration for famous poets and novelists like Fernando Sánchez Drago – "El Dorado", Angel Palomino – "Torremolinos Gran Hotel" and much more. 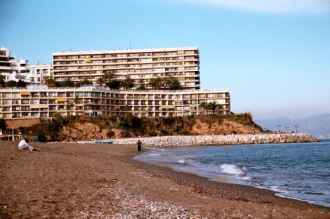 In 1979, a big movement started aiming for a newly independent Torremolinos from Málaga. 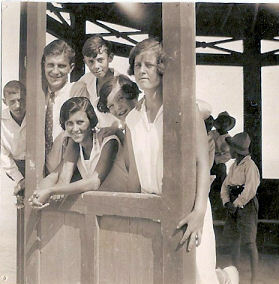 Reason was the poor attendance of Torremolinos as a tourist resort, resulting in important losses in this sector and as well some of the traditions and customs were disappearing it had as an independent village before 1926. The government of Malaga refused consent, although Torremolinos showed all necessary features for its independence: it had its own historic territory, approval by the majority of its inhabitants and of course sufficient economic power to survive on its own. The decision caused various protests, taking place the last one on a rainy day in December 1987 when almost all residents went to Sevilla. Finally the Junta de Andalucia recognized the facts and granted on September 27th 1988 the coveted independence, a date which since then is celebrated every year. The fight of Torremolinos for its independence can be considered exemplary, showing how civic mindedness and maturity lead to the aimed target, in spite of all the different interests involved. Since then Torremolinos has shown a nearly unstoppable progress. El Castillo del Inglés is the name of a famous castle in Torremolinos which years after its construction was used as headquarters for the customs office. At the beginning of the 20th century it was bought by Sir George Langworthy who transformed it together with his wife Anne Margaret into a country estate with big gardens and lookouts over the sea, giving work to many of the inhabitants of the fishing village. When his wife died in 1913 being 40 years old of a pneumonia, he fell into a deep depression which he should never overcome. 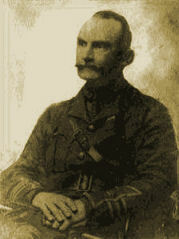 His condition got even worse when he participated as major in the First World War. When back Langworthy dedicated his life helping people in need. El Castillo del Inglés saw itself transformed into a shelter for the poor and sick. He helped them by giving everybody in exchange for a prayer of the bible a peseta which meant by then food for one day for a whole family. In 15 years Langworthy gave away more than 12 millions of pesetas, which was by then a great fortune… still today it is considered a lot of money, so try to imagine 70 years ago. To restore his financial situation a bit he accepted in 1930 the tenancy of the Castillo, to transform it into the first hotel of Torremolinos: "Hotel del Inglés". The business was a success from the beginning and the great beauty of its surroundings and well looked after gardens guaranteed the best guests, mostly British who enjoyed the marvelous climate. George Langworthy arrived in Spain with a big fortune and died as a poor man in 1945, surrounded by his employees and the whole village who gathered together to say good at his modest coffin. He was buried in the cemetery of Malaga and is until today the only "Adoptive son of Torremolinos", a honor which was given to him in 1918 for his great charity work to the citizens. It exists a street with his name, which leads to the Hotel Santa Clara, where there has been built a monument in his honor: unfortunately the spot where once his country estate stood is nowadays occupied by a modern hotel which doesn´t look like it at all. I often come to the adjacent beach of the former Castillo del Inglés and sadly little remains of its origins, even less if you don´t know the history of the place. Although now we are aware of it, it´s easier to imagine the place where George Langworthy attended to give his money and shelter to people in need. 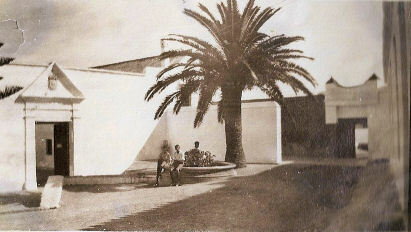 The fortress was built in1763 in the area, today known as Hotel Santa Clara and the nearby hills of Montemar. It was meant to protect the milling industry and the passing ships. It had quarters for cavalry and infantry, houses, storage rooms, a chapel and some cannons with a range of almost 6 km into the sea. There are still remains left on top of Montemar, known as "La Bateria". Today it´s a well looked after park with gardens where one can observe the old cannons. 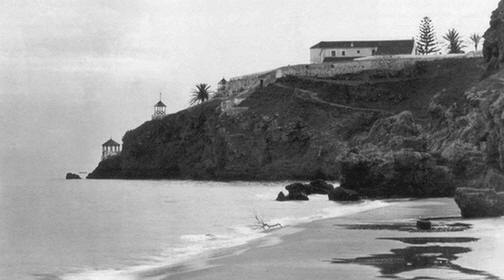 Sadly the Castillo had to give way to the construction of a modern hotel, which kind of disturbs the original landscape.